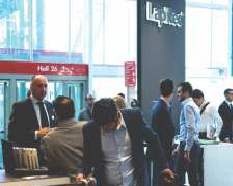 The 2015 edition of Cersaie was where Lapitec® decided to launch two important novelties conceived to enrich the range of solutions. The company offers even more choices for outdoor and indoor solutions, but also for kitchen countertops and flooring thanks to a new collection with three new colors and finishes. In 2015, the company expanded its novelties for the exhibition where it has been a protagonist for several years now. The new finishes, which will be added to the four existing ones, and the three new colors (including Arabesque), created to enrich their color palette, will be presented on the market. Skyline is instead a new project: a collection of utmost character, conceived to offer even more choices. To better promote the European stone market, three representatives of the Xiamen Stone Fair 2016 participated in Marmomacc, Verona, Italy. It’s the 50th ceremony of Marmomacc, a lot of visitors from Italy, Spain, Germany, France, Swizerland, Portugal, Vietnam, Czech, Croatia, Russia, Lithuania, Liechtenstein, Sweden, Korea, Japan and India etc. showed great interest in Xiamen Stone Fair 2016 after the organizing committee introduced the details of the next edition and development of the fair in past 15 years. And what’s more, the stone professionals from Italy, Turkey, India, Spain, Portugal, Korea, Vietnam and Singapore expressed their will to take part in Xiamen Stone Fair 2016. Meanwhile, their met the directors of stone magazines and industry association they cooperate with, they demonstrate the high praise to Xiamen Stone Fair, and make sure both parties involved will get the great advantage through long and stable cooperation.